Paying Ready Attention: Continuing West. After fours days of desk bound office work, six hours of fresh air had a predictable narcotic effect. As we drove away from the Spectacles my eyes grew heavy. In the sugar crash of the late afternoon I started thinking about coffee, and maybe a sly bit of cake. If it had been offered, I would have eaten the last bit of nut slice that I knew was somewhere in the car. I think Stuart was saving it for himself! Grey clouds and light rain ended a good day. There is a small café next to my hotel. The coffee tastes good, the cake even better. Hotel rooms (well at least the ones I pay for) offer a kind of cramped intimacy – nothing is every very far out of reach, and whatever TV the room has looks like a widescreen. But strangely the electrical sockets are always just out of reach of the power cords for my laptop. I look through the images for the day, tag a few, and delete more. A pre-dinner nap beckons. I awake some time later to a dark room and the sound of shouting in the street. With sleep-dulled recognition I see that it’s well past the time to eat, and with that thought I crawl under the slight, scratchy sheets and go back to sleep. I may have woken in the night to the sound of breaking glass and shouting, but I may have dreamt it. The maxim of early to bed early to rise holds true and a watery grey light flickers at the windows edge. The charging light on my laptop flashes a green beacon in the corner of the room. Clinging to my familiar domestic ritual, I make a cup of tea bag tea. It tastes bitter and flat. There is no shouting in the street. There is no bird song either. Ruler straight roads and right angle junctions make for simple navigation as I walk towards the Swan River, the slippery heart of Perth. Silver Gulls fight over scraps left on the pavement (it’s best not to ask). A pacific black duck – on the flanks of the wrong ocean – preens its feathers in the liquid splash of an ornamental fountain. Appropriate swans drift on the river and overhead, parrots call from the trees. Behind me are the towers of the city centre, in front of me the silent river. 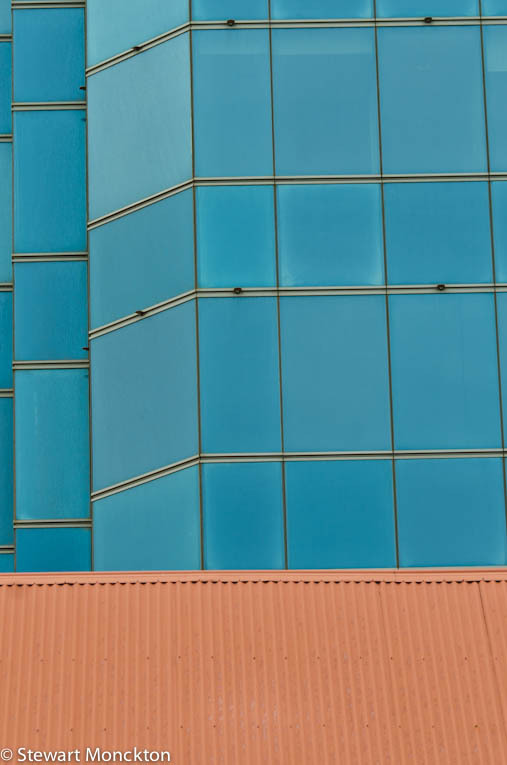 The old red of iron and the new blue of glass push hard against each other. 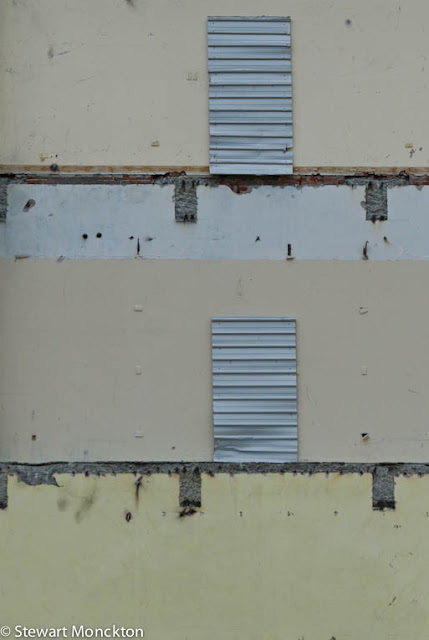 Middle-aged buildings, unloved for a lack of either history or modernity, are pulled apart to be remade in corporate image. The wind whistles in the scaffolding pipes, a safety harness rattle flaps against an empty cage. It’s cool but not cold. Saturday morning hangs heavy with the echo of Friday night. A long sleep and an early walk leave me ready for the wonderful excesses of the buffet. I can smell bacon, coffee and toast – the holy trinity of breakfast. When I sit down the food is piled high, but nobody else is there. I live in a land of plenty. It’s just after nine when I walk along Murray Street Mall; most of the shops are still closed and a small army of street sweepers are going about their trade. A few buskers and street artists are setting up for the day. And on street corners and under bus-shelters people are shouting again. A small group of aboriginal people are wandering about the mall, shouting to each other and seemingly to the ghosts I cannot see. Coke bottles, sludge lined with glue are passed around. The living proof that Terra Nullius was a lie are dying on the streets of today. A tall brunette, with long hair and longer legs, pushes a coffee in front of her like a shield. She crosses the road and walks on the other side. This creates an internal dilemma. Do I do the same thing, to avoid the possibility of conflict? Or do I stay on this side of the road to show some lame form of solidarity? As I choose not to walk on the other side I realise that this decision is not about solidarity or even social justice, it’s about making me feel better about a situation that is way beyond my influence. I can make some form of token gesture, but on that street, on that day, I know it’s about me and not the dispossessed. And that realisation makes it even worse. A man with a badly cut head uses his football beanie as an impromptu bandage. An ambulance arrives to help. His friends gather around him, crossing the street in front me to do so. The journey to their friend puts me on the other side of the road to the aboriginal people. I turn to walk back to the hotel. My cameras hang heavy. In a land of plenty, I have to wonder how such things can be. The hotel room offers the kind of surrounds befitting my mood; low key, silent, unremarkable. A text on my phone alters all that. Many, many weeks ago, through the random collision of strangers, I met somebody who knew somebody I knew as well. The seven degrees of separation myth crystallises into a greater possibility, and I make a contact. In Muscat, Oman, at a conference dinner, in a hall studded with unused tables and unfurnished with alcohol, a conversation started to flow. A teacher, like me (well historically anyway). An expat Englishman, like me. A new Australian, like me. 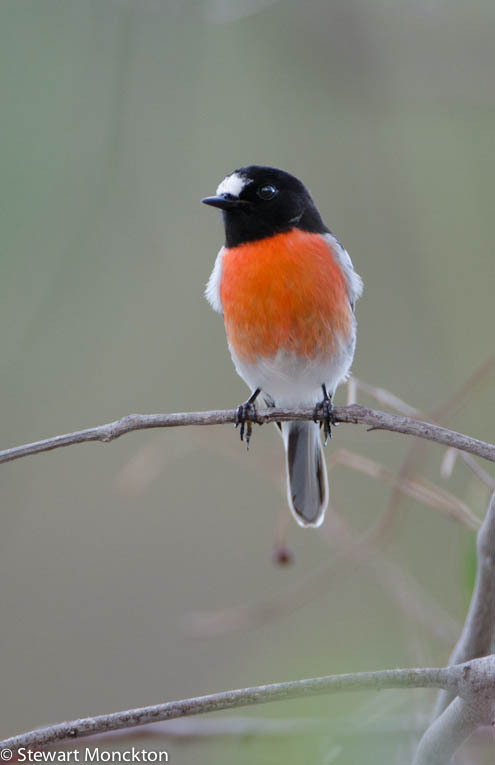 And, above all else a birdwatcher – but one with a level of skill and experience well beyond mine. He lives in Perth, I live in Melbourne, and now I’m in Perth and the text is from him confirming the time and place of our meeting. 2pm. Outside the hotel. Bring coffee. After the morning, it’s the splash of random, good-natured chance that I need to lift the gloom. I check my lens, reformat the memory cards and buy some coffee. I find a chair and wait. A face, familiar but not seen more than handful of times walks across the street. I had expected a car, but foot traffic is often faster. I meet David’s wife and we head off in search of birds. The flow of conversation begins again and spins around birds seen and missed, back referenced to time in Oman. Perth slides by, keeping on and on. Many Australia cities were built in a way that was lazy with space, and Perth is no exception. The house blocks are large, the nature strips wide and the roads even wider, but strangely some of the roads have no pavements; the garden wall meets the nature strip and nature strip the road. This anonymous strip becomes a no mans land, pocked with old sofas and the beached hulks of great white-whale refrigerators. The casual use of space speaks of a belief in endless horizons, never ending growth and the burning of fossil fuels. The coming years may prove this to be folly. We turn off the main road, heading along another with a military sounding name, and simply military straightness. Eventually we arrive at Wungong Gorge, and pull into the otherwise empty car park. Unseasonal dust spits from under the wheels, and a light dusting of birds flush from where the dirt fades, greening, into bush. Once more I am in the premier habitat – the car park. That you see lots of birds in the car park is no flight of fancy. Car parks often have that most valuable of wildlife resources, edges. The open dirt of the parking spaces zones through moss and lichen to grass and herbs; from grass and herbs to bushes and saplings and finally into older forests. In towns, car parks are squeezed into the dead spaces that retail rejects – but in the bush they are built next to interesting places, often natural places, places where things live. The loss of ground seems more than offset by the gain in diversity. The major problem of this habitat is their tendency to attract the thieving magpies of the human community. Window smashers, lock forcers. We leave the car more or less empty, and I carry far too much stuff. It’s the penalty of excess. The car park, with its zones and edges holds us for at least half an hour. Urban myth has it that most visitors to National Parks never move more than 500m from their cars – in a place like this I can see why. 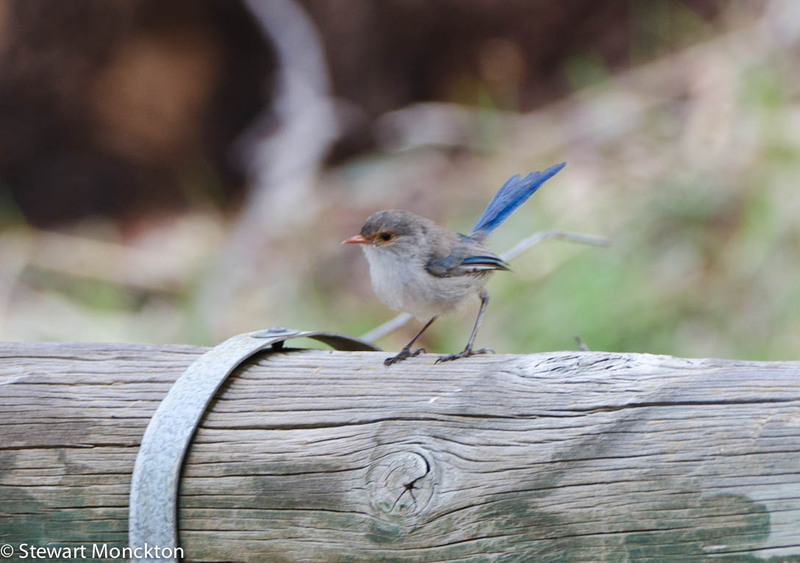 A White-breasted Robin flicks from up from the ground to land on a log barrier, only to be replaced by a Splendid Fairy Wren when it leaves. Hidden Red-capped Parrots call from the trees. On a down slope, along a fence line Red-winged fairy wrens move through the bushes, calling to each other and teasing us with little glimpses and half-clear sightings. Eventually one breaks ranks and sits still long enough for me to see the chestnut colour – I hear a tick click into place in my mind. As I swing the lens of my camera round, it remembers how it should be behaving and heads for cover. I never see it again. A vague track winds away from the back of the car park towards an area of battered looking bush and up on to a track of sorts. We step over fallen trees and broken branches; the wreck of a fallen tree has been pushed over the path, hiding it. Bird shadows move around the fallen branches, but they never stay still long enough to see. It was like watching dust float and dance in window-streamed light, when you focus on one speck the observation pushes it over into invisibility and you lose it in the background. I stand chasing shadows, while up ahead parrots call from the treetops and magpies trill and respond to each other. I choose a way forward that looks more solid than the others, and stumble through the wreckage up to the track. Although not old, the track flows in an old way – following contours rather than brutally cutting across them. It feels like a route made for comfort rather than just speed. Off to our left, down a steep slope, a dry looking valley leads back towards the parked car. The slope is populated by triffids – or at least some strange plant with bud/fruits that look like spikey unattractive Kiwi Fruit. Large bright butterflies flick up from the plants with eye-catching movements. Monarch butterflies – the same species that undertakes the famous migration through the Americas - spook from the plants as we brush them. Its hard – impossible - to filter out the movement and my eyes dart from attention point to attention point. Eventually I spot one resting and sneak up on it. It’s not just the birds that are new to me. The valley bottom is scruffy with weeds – blackberries – and abandoned fruit trees. Small birds move through the undergrowth, difficult to follow. But as they grow used to us and we grow used to them the watching becomes easier – and out of the movement Red Cheeked Firetails emerge. Tiny, but robust, a small flock gathers and chases around a tree stump. They flick over a low rise and disappear into the welcoming tangle. Back at the car, back in the car park, we take a welcome drink. This underrated habitat does not let us down. 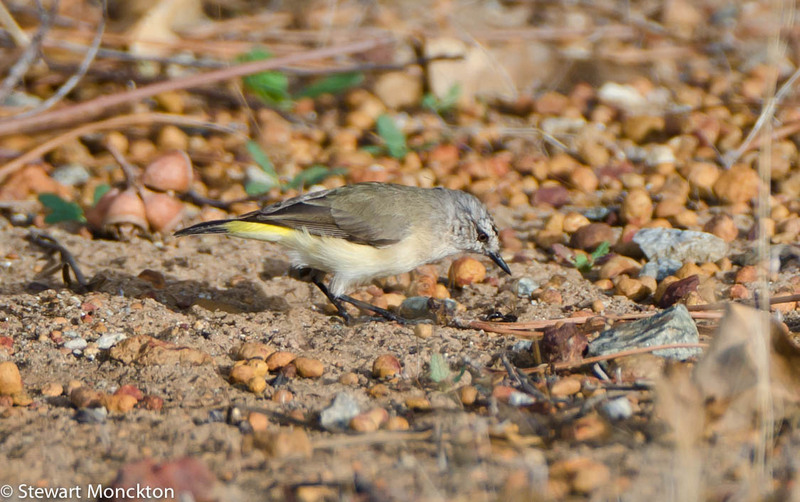 Yellow Rumped Thornbills pick at the loose gravel and a Scarlet Robin flashes red from cover to an open bush. Neither of them are rare, neither of them are ticks, but both of them are beautiful. It seems a good way to end the day. Such beautiful birds! 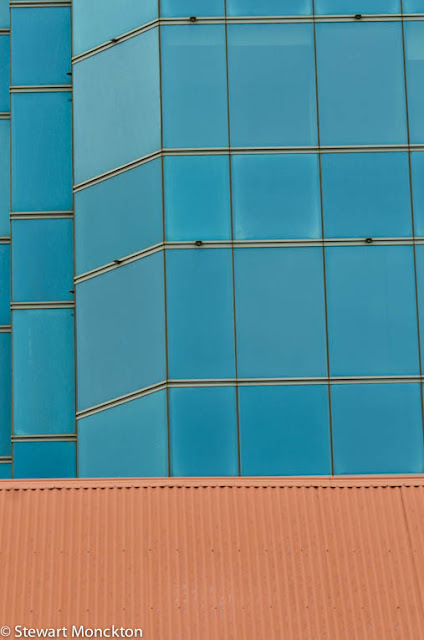 And lovely abstracts of the buildings too. There is so much about this place called Perth that I don't know, and am learning through your photos and writing. Great shots - and why is that, that the outlets are always too far out of reach in hotel rooms? I too, have found this to be true. 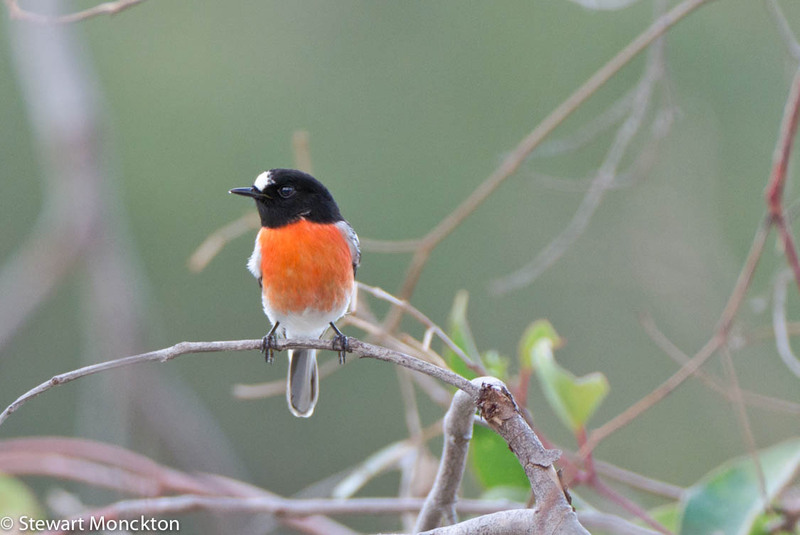 Great shot of the butterfly and Scarlet Robin!! !Have a lovely day! I enjoy reading your posts and seeing all the places and beautiful photos you take. Road trip! You have so many brilliantly colored birds over there. 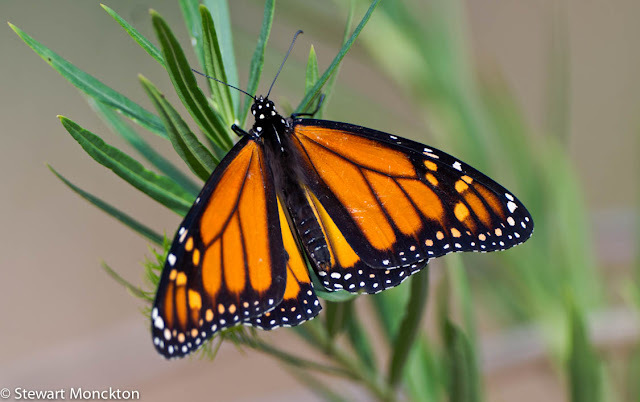 Do the Monarchs migrate from where you are? Wow. What a lovely place. And your eye captures exactly the things I am drawn to as well. The bit of rusty iron. The specific profile of objects! Great narrative and fantastic photos Stewart. One day, I'm going to go to Perth. I've heard so much about it. So nice to see the birds of the far west. So glad you got some fresh air after all. A chance meeting led to an unplanned exploration which produced an very interesting array of wildlife. That was such a good read. I don't think the car parks here can compare to yours, but next time we go to a nature or national park I will pay more attention. Just getting outdoors can cheer me up from a bad mood; if I saw all those birds, I'd be ecstatic (at least for a while).